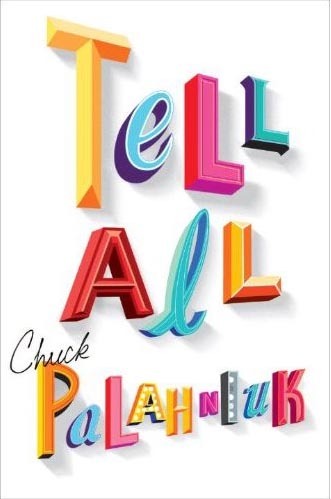 I had really been looking forward to reading Chuck Palahniuk's new book ever since I got my signed edition at the highly entertaining book reading I attended a few months ago. The premise, as he described it to us that evening, sounded intriguing - a novel written in the form of set directions and told from the vantage point of a sherpa for a glamorous Hollywood star. As Palahniuk described it, he was fascinated by these stodgy women he would often see at celebrity-studded events, who would carry coats, and bags and brushes and makeup, effectively allowing the star to be her glorious unencumbered self. These sherpas would always be standing in the wings, a few paces behind the star, and always out of range of the cameras and microphones. Tell-All is narrated by Hazie Coogan, long-time sherpa to Katherine Kenton, who tends to the star's needs throughout her multiple marriages, endless cosmetic surgeries, and a series of comebacks in Hollywood's fickle star game. She is fiercely determined to protect the reputation of her "Miss Kathie", to ensure that her charge's name is never slandered by opportunists and revisionists intent on capitalizing on their involvement with Katherine Kenton upon her demise. During his reading in Calgary, Palahniuk mentioned his fascination with the name-dropping rampant among the Hollywood elite and hangers-on. In Tell-All, he uses a device he refers to as name-dropping Tourette's syndrome, a rapid-fire string of bolded names, mostly of big stars from the golden age of Hollywood, who are now largely forgotten. I understand his point, but it gets pretty tedious, particularly when he uses the name-dropping as part of his characters' conversations, in which the names that are being dropped are imbedded amongst animal noises. Again, I understand what Palahniuk is attempting to do, to illustrate how all this name-dropping becomes nonsensical after a while, becomes part of the background noise. But I found it to be annoying. After a few too many chapters in which dinner parties are attended, domestic rituals are attended to, and many many names are dropped, the plot picks up when Katherine Kenton meets and beds a much younger man. In his suitcase Hazie discovers a tell-all autobiography of his life with the star, complete with the grizzly details of her impending death. It then becomes a deadly battle between the suitor and the sherpa for the life of and the rights to Katherine Kenton. Despite my initial disappointment with Tell-All, I ultimately I did enjoy this book. It's no Fight Club, and I had to continually forgive those annoying devices, which I found to be seriously overdone, but the final third of the book, especially as my realization of the plot twist started to dawn, did make Tell-All worth reading. But I felt that I had to work for it a little harder than I wanted to. I was in the book store leafing through Palahniuk's book just last week and it did look intriguing enough but I wonder if he will ever be able to ascend the lofty artistic heights of Fight Club? Kudos to him for trying something different though. Did he read much from this book when you saw him? I wonder how that would improve some of the difficult narrative in which you spoke. Palahniuk has written some interesting stuff since Fight Club, but I agree that he has yet to surpass that first stellar novel. And isn't great when the film is just as good as the novel? He spoke about Tell-All during the reading, but actually read a new short story instead, which also uses yet another unusual narrative form. All that brave creativity makes me want to write a haiku or something! I gotta confess that I find Palahniuk too gimmicky, but he does ferret out interesting crooks and nannies, doesn't he? Celeb sherpas - who knew? I found that whole concept fascinating as well, SME. Makes sense though. I've tried really hard to read a few of his works besides Fight Club, but must admit they never really kept my attention...oh well. He's not to everyone's taste, Al, and I still think that Fight Club was his most successful and intriguing effort to date.